Porthdinllaen is a small coastal village in the Dwyfor locality on the Llŷn Peninsula within Gwynedd, Wales. Its located on a small promontory, and historically in Caernarfonshire. 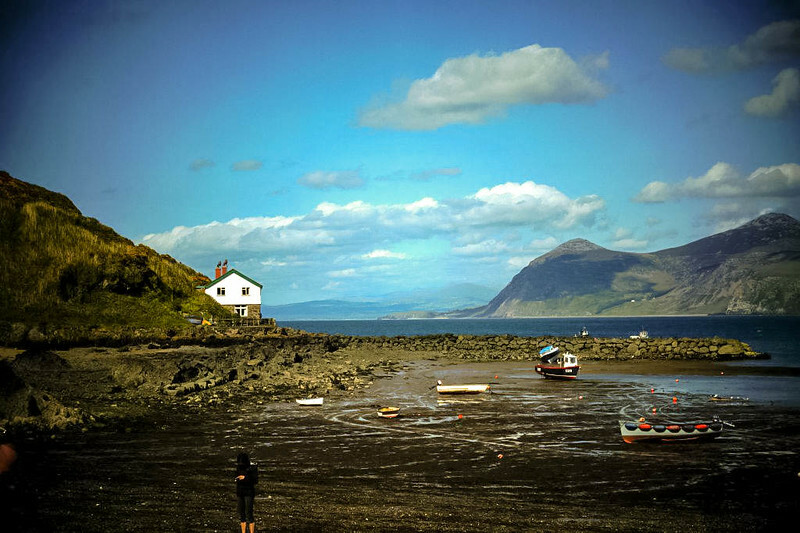 Porthdinllaen is an idyllic fishing village situated on a picturesque stretch of sandy beach. I first learnt about the Tu Coch Inn in an article rating it the 3rd best beach bar in the world! I remember thinking in Wales? Are they mad! I was intrigued from that moment on. With a week in North Wales planned on our 2015 trip, I put visiting the Ty Coch Inn at the top of the pubs in North Wales to visit. I had to visit this place to see how a tiny bar in Wales could be ranked in the best beach bars in the world. Sure I could imagine Australia, The Carribean, and even some places in the Mediterranean hosting this bar but not in Porthdinllaen on a beach in Wales! After visiting Caernarfon Castle and on a good sunny Welsh day we set out for Ty Coch. Days like this in Wales with blue skies and the sun on your back can be few and far between. But when the sun does shine, Wales is magnificent. 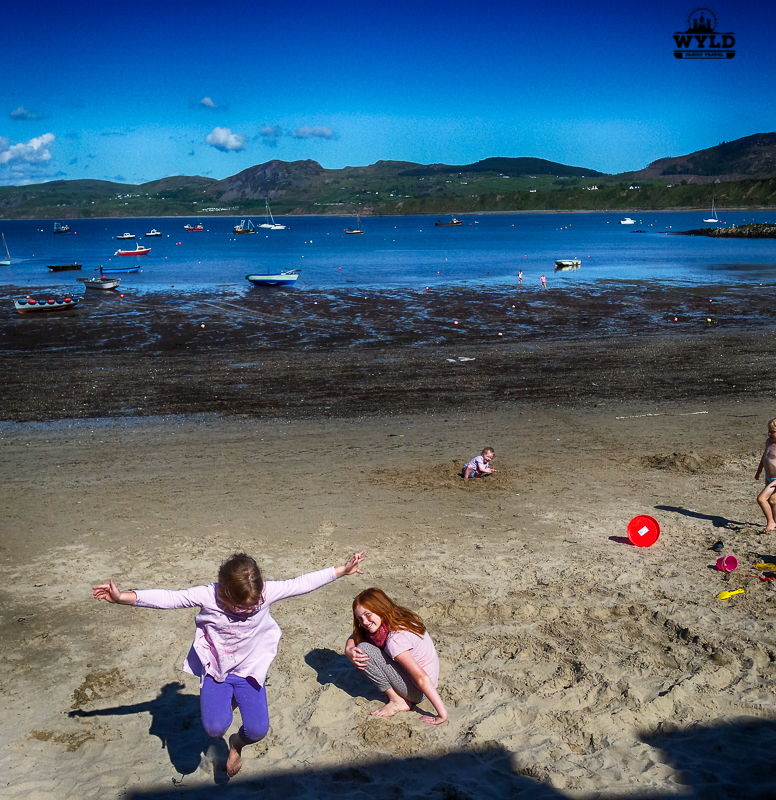 The green of the paddocks, the sparkle on the water, the sand between your toes, Wales is amazing on a summer’s day. We set out with some friends in two cars to find this place. The drive to Ty Coch Inn in itself was an amazing adventure through hills and valleys along the coast passing through little villages, paddocks filled with sheep and century-old stone fences was amazing. 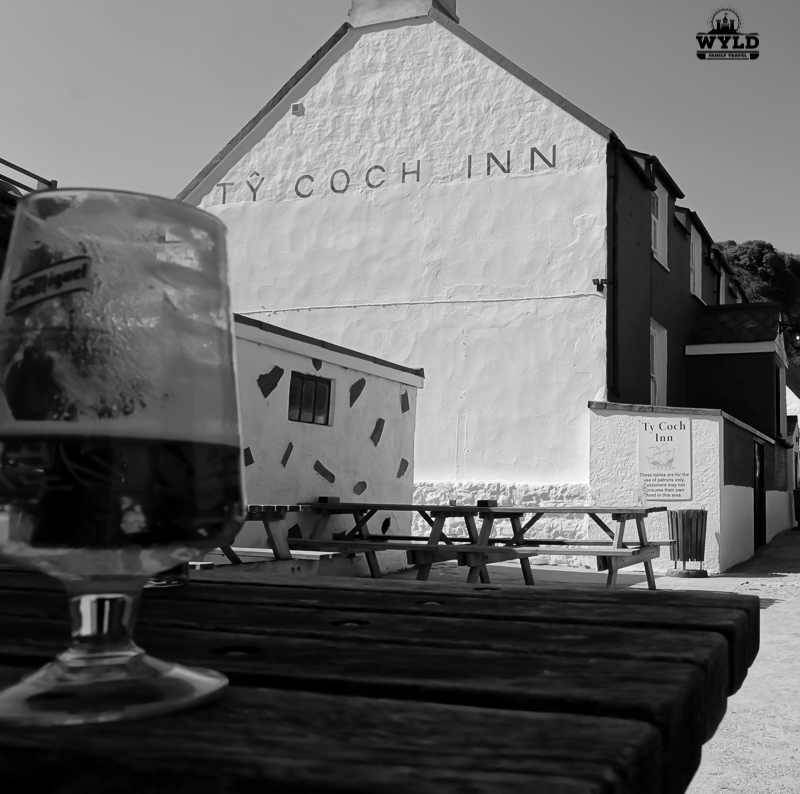 The Ty Coch Inn is 21 miles from Caernarfon castle which is the nearest major tourist attraction in the area. It takes about 40 minutes to one hour to get there depending on traffic and conditions via the A499 and B4417 roads. Take your time. Like I mentioned the scenery is beautiful actually, it was mesmerising, the drive itself would have been worth the trip. Upon arrival, there is a golf course…yes a golf course! Did I mention you can’t drive to this Inn you must walk about 20 minutes through a golf course to reach the Ty Coch Inn? You can park in the car park of the Nefyn Golf Club. (By the way, the Nefyn Golf Club is ranked in the top 100 courses in Great Britain.) 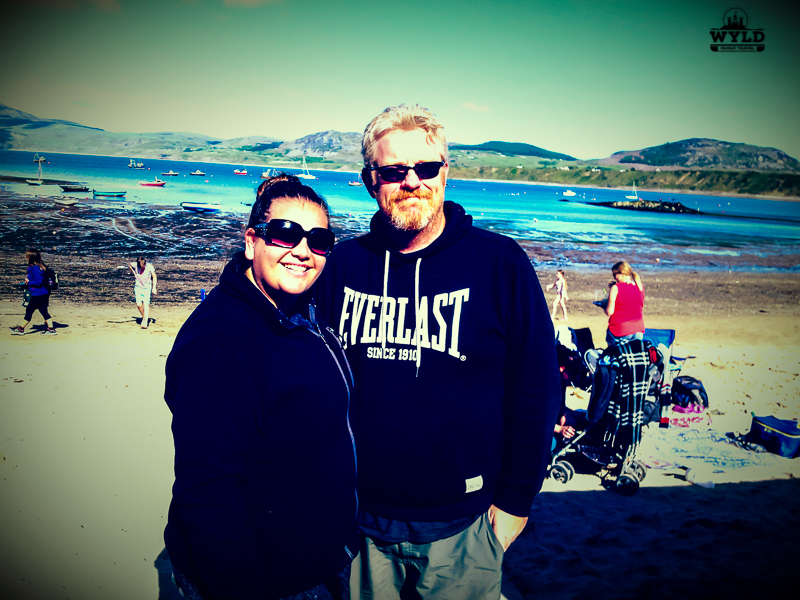 The nearby Nefyn beach is also worth a visit if you strike a warm day. If you are a golfer this course looked amazing as we walked through it. I could see myself launching my Taylor Made driver down the first with the ocean in the background, breeze in my face. 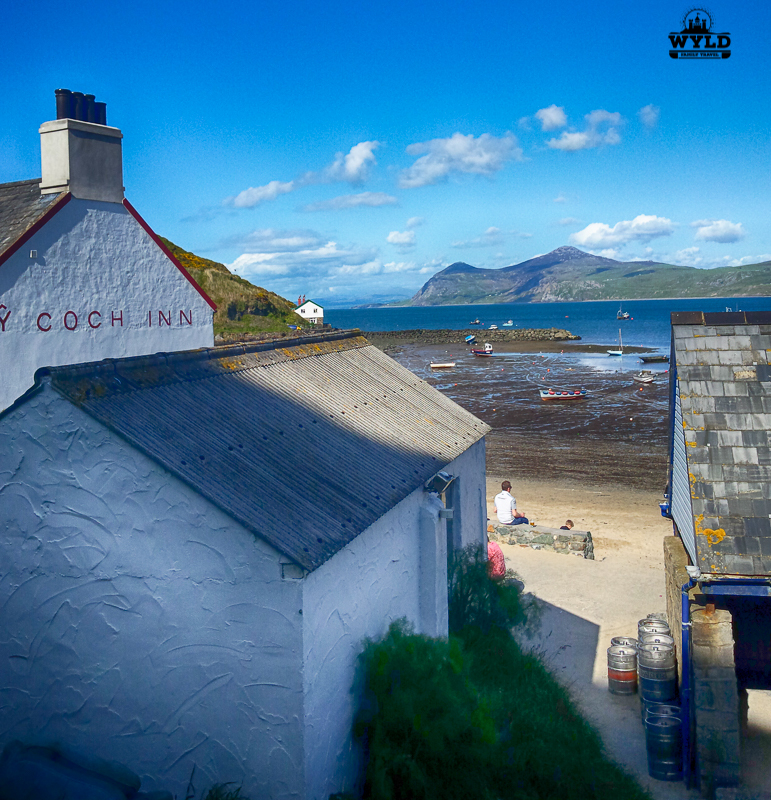 As you follow the sign that says Ty Coch Inn you head down a pretty steep hill that leads you in behind the Inn and provides you with the first amazing view of the bay that the Ty Coch Inn sits on Porthdinllaen beach. You are greeted with fisherman and their boats unloading their catch for the day, kids making sand castles and people of all ages enjoying a beer in the sun, looking at bright blue waters of the bay. Porthdinllaen beach is a good beach for kayaking, sunbathing and swimming. We had reached the Nirvana of pubs in North Wales. After the walk, you are well ready for a pint of beer or a cold soft drink. Did I really say soft drink? Well yes, I guess we do have kids. Check out a live feed of this amazing place on the Ty Coch webcam. You can find the Ty Coch webcam here! The Ty Coch Inn had Guinness, Carlsberg, San Miguel, Thatchers Gold Cider, Mansfield Smooth on tap plus some local brews from time to time. The Ty Coch Pub serves food from 12-4pm daily. They have a pretty good menu considering the size of the place. You will find pies, sandwiches, jacket potatoes, toasted paninis, a kids menu and specials of the day. Ty Coch Inn has a selection of wines and soft drinks available, something for everyone to drink. The inside of the Ty Coch pub is only small and most people drink outside on the picnic tables, the beach wall or the sand. The girls had ice cream and lemonade. What kids don’t like the sugar rush that this provides! Get your Wales guide here! We had a great few hours at the Ty Coch Inn and if you are ever in this part of the world make your way there and see for yourself why it is rated so highly. It requires some effort to get there but the reward is well worth it. The day we went there the sun was shining and warm. What made it more special for us as we went there with friends from the U.K that we only ever see when we are on holidays. Another great attraction in North Wales. Travel by train to the major towns of North Wales. Check the timetables and options here. That’s a part of the world we haven’t been yet but it looks great. Pubs with a Seaview are the best kind although you would hope it’s warm sitting outdoors! This place is awesome! No doubt fun for the entire family! Thanks for commenting we appreciate that you took the time. Yes i do love a beer and even more so in a great setting like the Ty Coch Inn. What a lovely little pub, I have been to Caernarfon castle shame I missed this pub. I am from S. Wales. Thanks for sharing. Thanks for commenting we appreciate it. Looks like a very cool place to be specially if you have family. We are too far away from there but for one day we will keep that destination in mind. You can never beat a drink with an amazing view! I love that this one is not your run of the mill type of place, an underdog of sorts that has been recognized for it’s excellence, and that it’s also a place you can take your family. Great info! Ahhhh, I love Wales! And I’m not surprised that it’s home to such a fantastic beach bar, the Welsh do beer and beaches very well 🙂 Next time I’m there, I’ll make sure to visit – it looks wonderful. That is a truly scenic and rustic place. We love rural shores and villages such as these.